Filming on location is not an option. On September 23, 2005, Magnificent Desolation: Walking on the Moon in 3D released on giant IMAX screens. It is a 4K stereo3D experience of the moon landings, and speculative missions from the past and future. The film was honored with the first Visual Effects: Special Venue award by the Visual Effects Society in 2006. 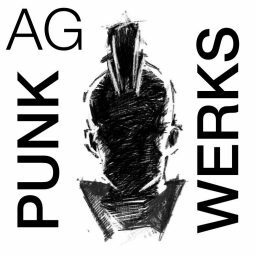 This multi-part article is based on a presentation about the visual effects at LA SIGGRAPH, the following June. Part 1: Prep and Landing —Preparing for Stereo3D in 2005 and Beyond. 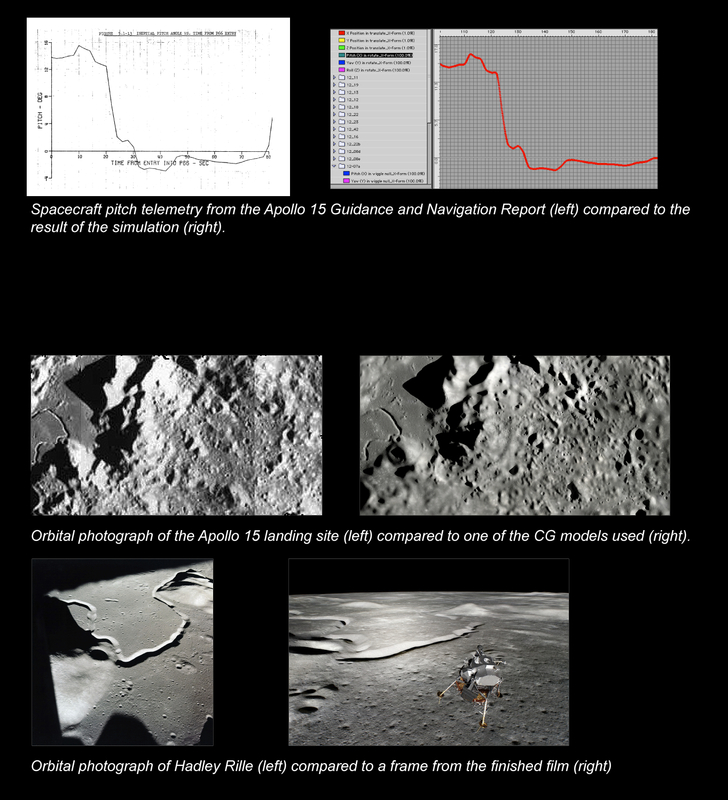 Part 2: Strolling on the Moon — Stereo3D Methodology and Innovations. Part 3: Touchdown — The work of John Knoll and his team. Part 4: Flight Time — The Lunar Flight Simulator of Paul Fjeld. John Knoll was partially responsible for this film being made at all because of his hobbies. He often takes on specific computer graphics challenges on his own time, just for the sake of doing them. One of those challenges was accurately recreating the Apollo 11 moon landings, based on available information. The producers of the film saw this footage, and asked his permission to use it as part of the initial pitch for the movie. Once green-lit, they approached him again to build the flight sequences of the film. His main employer for over the past 25 years has been Industrial Light and Magic. They turned the project down, and in the midst of some other large film he was working on in 2005, he cranked out stunning imagery for Magnificent Desolation from his personal studio — partially eliminating the process as an enjoyable hobby. Knoll used this as a scientific opportunity as well. It gave him the chance to more accurately depict the Apollo 15 landing sequence, as if someone had been there to witness it. His goal was to use actual data from the missions to drive the animation, and to recreate the Lunar surface as correctly as possible, despite the lack of good Digital Elevation models of the Moon. It was also one of his early forays into stereo 3D filmmaking, which would play an important role later in his filmmaking career. Over the years recreating Apollo 11 landings, Knoll found the records of the journey scant (in actuality, many of the original magnetic tapes had been recorded over). The only record available for the landing sequence was a printed graph with heights from the moon surface, as returned by the landing radar. There was no numerical data at each of the sample points, just a visual graph with height rulers across the side and bottom respectively. To solve the problem, Knoll scanned that image and brought it into a modeling program, after which he traced the graph. Once finished, he exported the model as a Wavefront OBJ file. Using a proprietary plug-in written for him by Northern Lights 3D, he imported the model as path data in Electric Image Animation System (a package he used since the early 1990’s on Macintosh platforms), with each point of the model accurately positioning the virtual lander. But, this clever solution would not suffice for the work on Magnificent Desolation. For Apollo 15 sequences in this film, his ambitions were a bit higher — to actually use a flight simulator for the Lunar Module, and fly to the virtual moon. “Spacecraft motion was the result of a rigid body simulation whose only inputs were attitude jet firings and throttle position, reconstructed from original spacecraft telemetry. This resulted in motion that was physically accurate, and very closely matched the recorded telemetry. Recreating the moon in 2005 was challenging, as the most current digital elevation maps (DEMs) of the lunar surface were rather sparse and did not easily lend themselves to near surface visualizations. Rather than attempt photogrammetry from Lunar photos, Knoll used NASA orthophoto maps available at the Lunar and Planetary Institute (created with manual photogrammetry techniques) as the basis for digital models. 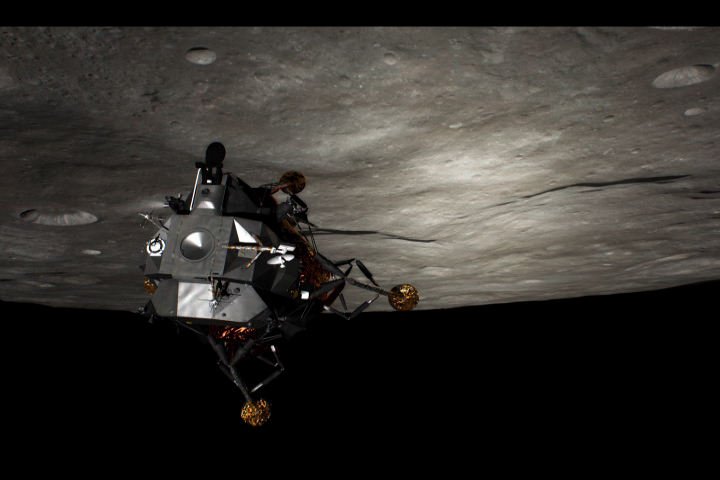 “I did the exterior shots of the Apollo 15 LM in flight and landing at Hadley Rille. I did go to a lot of effort to make the shots accurate. The spacecraft motion was reconstructed from telemetry, including the jet firings. The terrains were hand sculpted using lunar orbiter images as templates and mission photographs as reference. I don’t know how many people who saw it would care that that much energy went into making it correct, but it matters to me, and probably a few people at NASA…. The models were built in the software program Daylon Leveller, using height fields derived from the maps. To create the dusty, pockmarked surface, Knoll imported the model into Autodesk Maya, wrote custom shaders for the cratered surface in 3Delight (a renderman compliant renderer), and output single frames which he projected back on to the model in Electric Image. The final 4K images were rendered on a 23 processor box rented specifically for the show (approximately double the render power of the SFD team). The Lunar Module was a complete rebuild of the model Knoll used for his Apollo 11 landing. Because of the 4K stereo images, the spacecraft required every detail built-in to the model, as opposed to a bump map, or texture trick. The final Lunar Module, based on actual flight hardware, came in at 750,000 polygons. 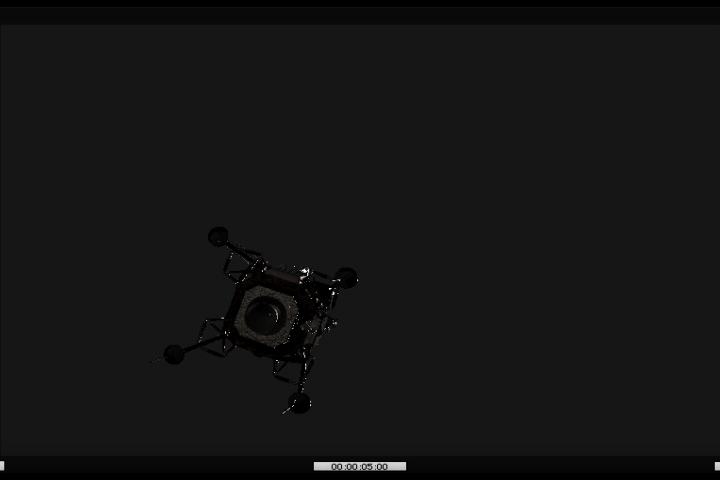 It was animated via the flight simulator, and rendered in Electric Image. Scott Simmons of Live Wire Productions, responsible for many stereo3D conversions of historical photos for the film, pulled extra duty helping Knoll’s team out with final painting tasks. His paintings were done in Photoshop (of course). Compositing for the shots by Knoll and associates was finished in Adobe After Effects, with Lens flare simulations by Knoll Flare plugins. “Before I started on the project, I met Dave Scott on the Sony lot. We spoke for a few minutes, and I told him I thought even with the latest technology [in 2005], it would still be pretty difficult to realistically fake the landings, and that I thought it would have been impossible to fake it back in the late 60’s. Next: Section 3, Flight Time – The Lunar Flight Simulator of Paul Fjeld. Focusing on theory and practice of stereo filmmaking, VFX and conversion.